Ocean Cottage 46 Dette 3 soveværelser, 3. 5 bad hytte fangster essensen af kystnære levende. Dette hjem er beliggende i Jekyll Island nyeste hytte kommune, The Cottages på Jekyll Island og er klædt med havudsigt. Dette sommerhus har 2 master suiter, en på hver etage og en anden etage køjeseng med 4 køjesenge. Der er også en sovesofa i opholdsstuen, som når trukket og oppustet, sover komfortabelt 2. På første sal er der et åbent køkken, der strømmer ind i den rummelige spisestue og stue. Køkkenet er udstyret med rustfrit stål apparater og en Mr. Kaffemaskine. Denne hytte giver nem adgang til en garage væk fra køkkenet. Off af de vigtigste opholdsstue er en screenet i våbenhuset, perfekt til hver sæson. Anden sal huser en af ​​de to master suiter, samt køjesalen. Anden sal har også et lille opholdsområde og et rummeligt vaskerum. Vedhæftet til anden sal master suite er en screenet balkon lavet til at se solopgangen. Dette sommerhus er "Osprey" grundplan og rummer 10. Single Car Garage, 3 Parkeringspladser inklusive garage. Hvis vores nej kæledyr eller ingen rygning politik er brudt, vil en $ 500 bøde blive opkrævet. Strandadgang: Fortsættelsen med staten Georgia's Jekyll Island Revetment Rehabilitation Project har resulteret i midlertidigt tab af adgang til vandet til vandet langs vores strandlinje. Der er stadig adgang til højvande strand, landside af rock revetment. Vi anbefaler Driftwood Beach, der ligger nord for hytterne eller blot et par minutter væk sydpå med bil til Great Dunes Park-området. Vi undskylder for eventuelle ulemper dette kan medføre under dit besøg og værdsætter din undersatnding betydningen af dette projekt. For mere information om "ting at lave" på Jekyll Island, besøg Jekyll Island hjemmeside. Accommodations were spectacular and spacious! Beautiful view of the ocean when we awoke in the morning. We actually cooked our Thanksgiving meal at the house and found the kitchen to be amply supplied with all of the cooking tools we needed. We love Jekyll Island and love this location. Great for bike riding and convenient to all of our favorite activities to do on the island. Highly recommend this lovely home for a family gathering. A big "Thank you" to the owners from the Maser Family! Thank you for your review! We are pleased that you enjoyed your stay and look forward to your next visit. We loved our time staying here! 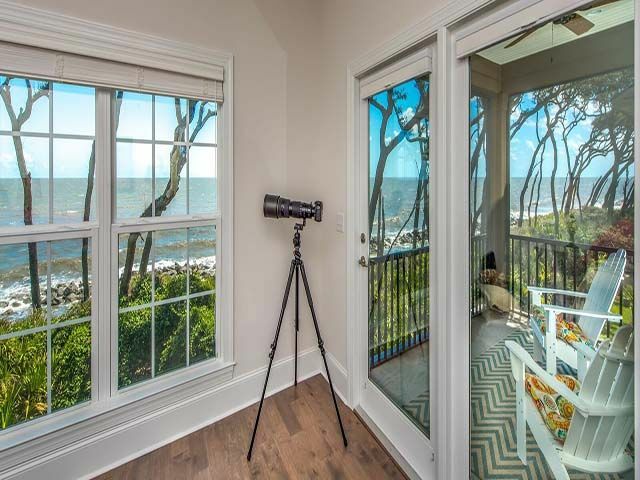 It was a beautiful home in a wonderful community with direct access to the beach. It was perfectly sized to bring 9 people and we still had enough room to spread out. We stayed here for the annual GA/FL football game. So sadly we didn’t spend much time out in the community, but the pool and club house were great! The house came with great perks (such as bikes) but really lacked on basic necessities. There were just enough towels, but no extras and no beach towels (and no laundry detergent to wash your towels if you needed). There were also only 3 trash bags, 2 dish washing pods, and only one roll of toilet paper/paper towels. For the price of this cottage I really expected more out of the basic necessities. Overall a great experience though! Perfect place to gather and kickback! This is a gorgeous, well maintained spacious property, right on the beach. All amenities you can think of were available either in the property itself, or close by. Everything is exactly as described on VRBO, which is where I booked. The house was immaculate, it has a two-tier deck (gorgeous sunrise views), beds are comfortable, I was told the sofa-bed was also comfortable, the decor is coordinated and pleasant, the appliances are all high-end, and there is a great array of cookware, crockery, and silverware, and there is a grill! The team were responsive to my emails sent once I arrived. Linen and house in general was clean and fresh which is very important to me and my party. Without doubt I would recommend this property and beautiful location. Thank you Allison! Thank you for the review. We are so glad to hear that you enjoyed your stay. Hope to see you again soon! Ocean Cottage 46 was great! We enjoyed being on the ocean and so close to the pool. All of the beds were super comfortable and lots of space for everyone to enjoy. My only complaints are that all the rugs and bath mats needed to be cleaned through out the house and they needed a colander and pasta utensil in the kitchen. If we come back to Jekyll Island we would stay at the Cottages again. Thanks for the review, April! We are so glad to hear that you enjoyed your stay. We will make sure to address your concerns. Hope to see you again soon! Well appointed, close to pool and beach. We had a wonderful stay! We are glad that you enjoyed your stay we us! We hope to see you again soon. The cottage was perfect...no words can describe the great week my husband and I had with our children and grandchild. Thanks for the review, Debora. We hope you'll come stay with us again soon!